DETROIT – One recent afternoon, in this hardscrabble city, in a downtown office high rise overlooking the Detroit River, assistant U.S. Atty. 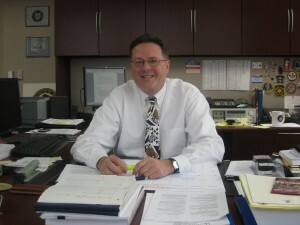 Eric Straus, chief of the criminal and national security division, sat down with ticklethewire.com editor Allan Lengel. Straus, a 21-year veteran of the office, talked about a host of subjects including the American invasion of Iraq, the region’s sizable Middle Eastern population, one of the largest in the nation, Saddam Hussein’s spies in Detroit, the presence of Hezbollah supporters, public corruption in a town where a man once dubbed “the hip hop mayor” is behind bars and a new policy that allows his office and other U.S. Attorney’s offices to pass on highly secretive grand jury information to U.S. troops overseas. The following answers were condensed and the questions were edited for clarity. Q. In terms of counter-terrorism, how does Detroit fit in to the picture? A. We have a disproportionate number of resources committed to national security cases when you compare it to other districts. I believe it’s one of the largest national security units in the country. And we’re a smaller office. We just prosecuted a couple people . They were exporting telecommunication equipment to the former Saddam Hussein government in Iraq. You may have seen in the news just a couple days ago a person who was arrested, I believe in Maine, for essentially spying in the Detroit area on behalf of the Saddam Hussein regime. We’ve had about four or five of these indictments in the last probably two or three years. Most of the results have probably been obtained in the last year. There are a lot of these individuals, their identities were learned through some of the documents that were recovered in Iraq after the 2003 invasion of Iraq; various Iraqi intelligence agency documents. Q: Were these folks actually working full time for the government or were they just sort of informants? A. I think it varied. I can’t tell you whether they were (all) full times intelligence officers. I rather doubt it. In the intelligence world you have to have a cover, so they were doing something else. I think in a couple of the cases, the Iraqi community here in the Metro Detroit area suspected that they were at the very least sympathetic to Saddam Hussein and in some cases, actually thought they were spying and reporting back to Iraq prior to the war. Q. Was that hard to prove without the documents? Q. Are there still other cases? A. I think at this point, we have a five-year statute of limitations. The war ended in 2003. We’re probably running up realistically (against) a five-year statute of limitations. Q. In this town, folks supportive of Hezbollah go back and forth from Detroit to Lebanon. There’s also sentiment in favor of Hamas. What’s your sense of what’s going on in the community? A. I can only speak on what we’ve publicly charged, proven or presented into evidence. We have charged a number of individuals with supporting Hezbollah in various ways. We’ve received some guilty pleas to material support of Hezbollah. We have a gentlemen, he was sentenced to 54 months of imprisonment. He pleaded guilty to conspiracy to provide support to Hezbollah. He organized and hosted meetings at his Dearborn residence. He featured speakers from Lebanon, during which the participants solicited donations to Hezbollah. The money solicited was intended to support Hezbollah’s orphans of martyrs program to benefit the families of those killed in Hezbollah terror operations or (fighting) Hezbollah enemies. During one of our detention hearings we put into evidence testimony that the term orphan often times was used as a euphemism for support of Hezbollah. Almost invariably they’re orphans of suicide fighters or people who have engaged the Israelis in conflict. Q . What about people in the organization who say the money is going to hospitals and education. Does it make your case tougher? A. From a jury standpoint it muddies the water a little bit. Our basic rebuttal to that is any money that goes to Hezbollah, anything that’s a so called Humanitarian mission, really, it frees up more money to go to its military and terrorist operations . Point number two. The State Department has designated Hezbollah as a foreign terrorism organization. So regardless of whatever your intent is and whatever you’re earmarking that money for, any money whatsoever, for whatever purpose that you send knowingly to Hezbollah, is a crime. I think if you dig a little deeper below the surface, most of those individuals will at least acknowledge that they understand that one of the missions of Hezbollah is to first, drive the Israelis out and two to advance a more radical Shiite Islamic vision on Lebanon. Q. What about Hamas? Do you see Hamas here?. A. I don’t know that we’ve had any cases where we’ve publicly shown a connection to Hamas. There’s certainly support here in the area for Hamas and other Palestinian rejectionist groups that are designated as FTOs – Foreign Terrorist Organizations. They are something that we would be interested in and we carefully monitor. Our mission is first and foremost to prevent another terrorist attack and so we use our criminal tools to do that. Q. Is there any backlash from the Arab community from people who say these people are just trying to establish a Home State? A. I don’t know if it’s caused any tension. We try to deal strictly with the prosecutions, we understand there’s a public relations component to that. And we do what we can throughout our cases, which is really limited, particularly when you have pleas, of getting the information out there about who those people are, what they represent and the danger they pose to the national security. Beyond that we don’t have a lot of abilities to change the hearts and minds of people who think these are freedom fighters. Q. Is there a concern that al Qaeda may have a presence here? A. I can’t comment on anything. So far we have not to my knowledge prosecuted anyone associated with al Qaeda in this district. But to define that threat as only al Qaeda is somewhat misleading. Because al Qaeda is only one part of a much larger international jihadist movement. When you say al Qaeda I think there’s a movement away from using that term to describe a much larger international jihadist movement. Q. Are you seeing any particular problem with hate groups in Michigan? A. We did prosecute a Rochester Hills woman for communicating a terrorism hoax and making a false statement to federal agents . She left a recorded telephone message at a BP Refinery in Oregon, Ohio in which she falsely stated that two specific employees there were plotting some very bad terrorist activity toward the refinery. The defendants had falsely specified two employees of Middle Eastern descent as the alleged plotters and she was ultimately indicted and convicted . I know our office prosecuted one or two individuals who were involved in threatening an Imam in a mosque. Q. What have you been doing lately to foster the relationship with the Middle Eastern community? A. We were one of the first districts in the country to develop the Bridges Programs. Largely because at the time in the aftermath of 9/11 there was a lot of concern in the community that the immediate backlash would be a blanket backlash against the entire Muslim community. And so that was set up with various representatives in the community. Now it’s become more or less a monthly or every couple months meeting where representatives from our office and federal law enforcement meet with those same (community) representatives and talk about various issues. At least on one or two occasions, people brought representatives from the U.S. Treasury Department, the Office of Foreign Asset Control, who came out in the aftermath of some investigative activity relative to charities. I think it was well received. They explained the law giving money to charities the government was looking at. Q. How about in terms of public corruption , what kind of emphasis has there been on public corruption here? A. Obviously if you’ve been reading the paper public corruption is one of our top priorities , particularly given the state of affairs of the city of Detroit . Our U.S. Attorney has certainly emphasized that. Q. What can you say about public corruption here in the city of Detroit? A. Probably not much . You can go back and look at some of the recent coverage of guilty pleas. We’re doing some public corruption work, but beyond that I can’t comment. Q. What about espionage here? A. The cases that we’ve had thus far that have been prosecuted mainly dealt with spying on behalf of a foreign government; that is Iraq. The Department of Justice places a high priority of protecting a wide variety of technology not only tangible products, but also the technology. That’s something we are certainly sensitive to and something we want to assure we have enough resources to devote to. Q. When you talk about technology , what type of technology? Auto related? A. The two areas are of big concern are military technology . Number two is dual use technology. That’s a little harder. That’s technology that has a civilian use but may also have a military application. Q. Over time the office has lost some high profile cases like the one against attorney Geoffrey Fieger. I guess the question some people might ask is: Does a big loss make you a little gun shy to go after big cases like that? A. Generally as you know from watching cases all over the country, public corruption cases are some of the most difficult cases that we prosecute. Often times the evidence is difficult to obtain, often times the cases involved usually involve some type of payments between two individuals. It’s not always easy to get one of the two parties to the conspiracy to cooperate. Sometimes it’s necessary to use more sophisticated techniques like electronic surveillance, wiretaps. They’re lengthy investigations. We have had a number of successful public corruption cases over the years. Q. Has any of the rules changed since you began investigating terrorist cases in the last few years. Do you have more latitude? Is it easier to get a wiretap? A. I haven’t seen any changes. We have always had a fairly stringent review process. (But) we have to be sensitive. We’re generating foreign intelligence information that may be useful to someone in the CIA or someone in the battlefield. Where before if we had someone go into the grand jury: “I know about Taliban troop movements in Afghanistan”…. under those prior rules we couldn’t take that information and give it to the military. Now we can take that with notice of the court and pass it on. We have done that around the country. That is something that is encouraged by the Department of Justice. We are encouraged to share information. Posted: 12/19/08 at 9:37 AM under Special Report.